MXA test riders like the simplicity and performance of WP AER49 air forks. They are simple to tune for riders of all shapes, sizes and skill levels. Are the WP AER 48mm air forks the best forks on the market? No. 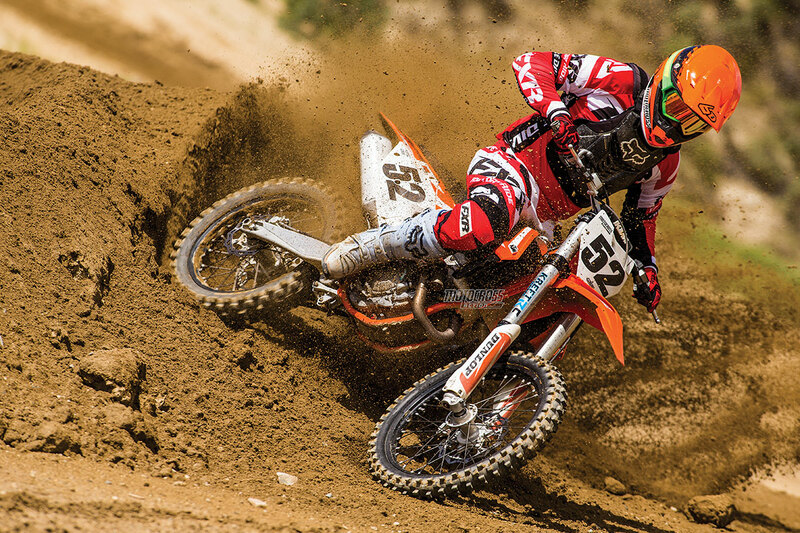 Most MXA test riders race with WP cone valves or Kayaba SSS coil spring forks. Why? They track the ground better. This makes for improved feel at the bars. Air forks tend to chatter over the little bumps because of the nature of air springs. But, we found an AER air fork kit that solves this problem. Amazingly, Kreft Moto has a fork kit that allows you to re-valve your own AER air forks with the turn of a dial. Kreft’s Re-valve Control System uses a 12mm hex head adjuster on the bottom of the damping rod to apply spring pressure to the mid-valve’s compression stack. It adjusts like the high- and low-speed adjusters on a WP shock. The Re-valve Control adjuster has an adjustment range of four to five full turns. Each turn makes about a 20 percent change in the valving of the mid-valve. With that big of change per turn use quarter turns to fine tune adjustments. Kreft claims that users of their Re-valve Control system won’t have to send their suspension back if the valving is too stiff or too soft. They also said the system could be adjusted so that it would be soft enough to ride offroad terrain or serious motocross with a click of the dial. We didn’t believe it. So, we had the Kreft guys fly down from Oregon to let us test the Kreft Re-valve Control forks on a variety of terrains. The best place for this test was Glen Helen Raceway. Glen Helen offers three Supercross tracks, a scrambles track, two full-size motocross tracks, a Lucas Oil Offroad Truck track and 900 acres of trails. We started on the AMA National track. Our initial thoughts were that the Kreft forks felt a lot like WP Cone Valve forks. The front end was glued to the ground. You could feel the smooth movement of the forks working underneath you. We were able to relax our grip and let the suspension do the work over rough terrain. The plush feel still had good bottoming resistance. Although, when placed under a high-speed load, especially on decel, the forks rode too low in the stroke and felt harsh. Adam Kreft suggested that we go a half turn stiffer on the Rebound Control. Surprise, the forks felt completely different. They rode higher in the stroke and were still plush on small chop. We could raise or lower the WP air pressure a few psi to get even more control. After our time on the motocross track, we set out on Glen Helen’s offroad loop. It had rocky ravines, steep uphills, incredible downhills and high-speed dirt roads. We adjusted the Re-valve Control full soft and went out on the compression and rebound clickers, but the forks were on the stiff side when hitting rocks or big bumps. We came back to the pits and lowered the air pressure from 145 to 133 psi to get the forks to move freely through their full travel. That took care of the harsh spots. It felt just like offroad suspension should. The range of versatility with Kreft’s Re-valve Control System was incredible. If you want improved overall feel, try this kit. If you want to be able to have different valving for different tracks, try this kit. If you want to able to moto in the morning and trail ride with your buddies in the afternoon, try this kit.